When it comes to Google Ads, formerly Google AdWords, there are a lot of factors that can impact on your results and unless you have intimate knowledge of the platform it can be a minefield trying to know what to look for. Thankfully there are many digital agencies and freelancers out there that can help. But how do you know if they are doing the best job they can when on the face of things everything seems to be okay. The question is could it be better? Auditing of your Google Ads accounts is an important process that shouldn’t be overlooked, whether your account is new or old. There are several simple things you can check for yourself to make sure no corners are being cut. One of the quickest ways to check your account health in Google Ads is to navigate to the ‘Recommendations’ tab on the right-hand side panel, which will display account opportunities flagged by Google. You will also see an ‘optimisation score’ and where gains can be quickly made. While this is useful, and you would expect this to be above 60-70%, Google can provide recommendations that your agency is not acting on for various reasons. It may be that Google is trying to automate and your agency has decided to retain control. If in doubt, ask. If you simply want to know if your agency is making use of your management time, you can quickly check the change history which will detail when any actions have been carried out on the account. If changes aren’t frequently being made, then you want to raise this urgently. But while the change history can show you what is being done it doesn’t always mean someone is in the account day to day making sure everything is running okay as a lot of these changes may be done using automation. So, how do you audit your Google Ads account? Tracking is a key pillar in knowing how your campaigns are performing. Without tracking, it becomes unclear which keywords, products or ads are driving sales or leads. It is not only crucial to have tracking in place, but you also want to know that what is being tracked is relevant to your business. For example, if you run an e-commerce site the key thing you want to track is transactions as this is what is bringing you revenue. For lead generation, you may want to track users who are calling your business or submitting enquiry forms. Outside of these macro conversions, you may also want to track micro conversions that can be indicators of success for different types of campaigns, such as ones driving brand awareness. These micro conversions can also indicate user engagement. Micro conversions may be things such as a subscription to a newsletter or the download of a brochure. To check your tracking in the Google Ads account you can navigate to Tools > Measurement > Conversions, where you should be presented with the below screen. 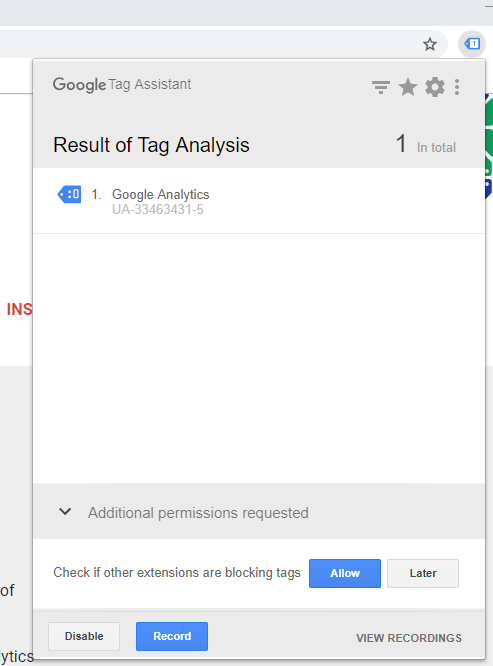 On your website, you can also use a Google browser extension called ‘Google Tag Assistant’ which allows you to see any Google tags that have been deployed on your site with the quick click of a button. Once the extension is installed you will see a little ‘tag’ icon appear next to your address bar which you can click on. You will then need to click enable and refresh your page. Each page will display different results depending on what tracking has been added to each page. Essentially the conversion points used should reflect the actions you want a user to take on your site. In some instances, you may just want to report on the macro conversions it will depend entirely on your business model. Within an account, you can have multiple campaigns, and each campaign can have multiple ad groups. Keywords and ads are both associated at an ad group level. The structure of the campaigns will vary depending on your business, but usually, these will follow the logical path of your website, such as a campaign for each product type, brand or service. The structure of the campaigns is key as this is the level at which budgets are allocated. If you only have one campaign, for example, you would be unable to allocate budget specifically to certain brands or products. The other key part of the structure is the ad groups and how these have been segmented. The most common and recommended structure is SKAG, which stands for Single Keyphrase Ad Groups, which essentially means, that each ad group only contains one keyword. The reasoning behind this is that through this level of granularity you can develop more tailored ad copy that can match up to each keyword. If all keywords were within one ad group, the ad would only be highly relevant to one of these keywords. As an example – PPC Agency and Paid Search Agency would sit in separate ad groups, as while they are advertising the same service you may want to adjust the ad copy slightly to reference the correct keyword for each. For ad copy, Google recommends having no fewer than three ad copies per ad group. This is to help and promote testing so that Google can build a better picture of which aspects of the ad copy are performing best and show these ads more frequently. One of the quickest checks for this is to get the total number of ads live in your account and divide this by the number of active ad groups. To do this you can first navigate to Search campaigns in the top right-hand column > Ads & Extensions > Filter > Ad status > All enabled. You can then scroll to the bottom of the page to get the total number of active ads. You can then repeat this for ad groups so navigate to Search campaigns in the top right-hand column > Ad Groups > Filter > Ad group status > All enabled. Again, you will then want to scroll to the bottom of the page to get the total number. If you also click on the little white/ grey box, just under your filter to select all ad groups or ads this will also give you the total. If the number comes out at less than three then you know some ad groups do not have the recommended number of ads. There may be reasoning behind this such as your agency is testing landing pages, but it is worth raising as Google is looking more and more towards the use of three ads per ad group and grading accounts as such. 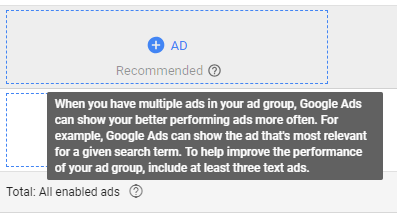 On the flip side of this, there is also such a thing as too many ads per ad group as you wouldn’t really want more than five for a small to average size account as this makes testing and optimisation more difficult. Finally, you want to know if all appropriate ad extensions are being used. Within Google Ads there is a range of extensions that can be applied to search campaigns which can help with your ad rank, which in turn can help you appear in better positions for lower costs, as well as gain you additional advertising real estate. You can check which extensions are in place by going to the Ads & Extensions tab and clicking Extensions on the top panel. You can toggle the view to see extensions data as a whole or to see which campaigns they are associated too. Targeting is a big part of who sees your ads, how they see your ads and where they see your ads. This encompasses things like whether they are new users or returning users, which devices they are using and the times of day in which they are searching. When campaigns are created it is very easy to just adopt Google’s default settings, but that is putting a lot of trust in Google’s settings being right for your business. Default settings can work in the first instance, but it is important to ensure these haven’t just been blindly overlooked and that they are reviewed at a later date if they are used. The reality is you may only have so much budget available for your marketing activities and this may mean that some of your Google Ads campaigns are limited by this. If this is the case, you want to know that the budget you do have is being spent in the most efficient areas, tying back into the importance of your account structure. You can do a quick check of this in the account by looking at the budget split across campaigns against how many conversions each campaign is bringing to the business. You would also want to check your return on ad spend (ROAS) or cost per acquisition (CPA) to ensure these campaigns are bringing in conversions profitably. You can also take a look at what campaigns are spending per day by looking at yesterday’s data for example. It may be that budgets can be moved around. Normally not all devices convert at the same rate, which means that you may need to pay less on one device for it to achieve your desired CPA or ROAS. 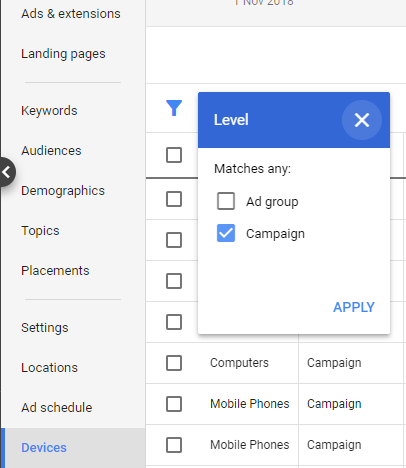 You can quickly check if any optimisations are in place by navigating to ‘Devices’ on the right-hand side and toggling the view between campaign and ad group. If your budget is limited, you want to ensure that it is being spent at the times of day and days of the week that are going to achieve the best results. For example, you may want your ads to be offline through the early hours of the morning so that you have some budget left at the end of the day. Whilst Google will try to spread your budget, if it is heavily limited you may find that your budget has run out before you’ve even got to lunch time. You can quickly check if any optimisations have been put into place by navigating to the ad schedule tab. On the chart at the top if there have been adjustments to bids the block of time will be highlighted yellow. In the table, you should see a column for ‘Bid adj.’ where you can also see any adjustments that have been made for certain days and times. Remarketing and the use of audiences is becoming ever more a crucial strategy in Google Ads, so you will want to ensure that your account is utilising these. There are some exceptions to this as in some industries such as medical, audience targeting is not possible due to the personal nature of the topic. Audience targeting can help you bring otherwise lost customers back to your site, cross-sell products or services and increase your ROAS to name a few. Typically, Google suggests that remarketing audiences used on the search network have 71% higher click-through rates and 56% higher conversion rates. You can use audiences defined by Google that look at lifestyles and interests or you can define your own audiences (remarketing lists) based on how users have interacted with your business or website. You can check if remarketing audiences have been set up in your account by going to Tools > Shared Library > Audience Manager and look at the ‘Usage Status’ column. To see how audience lists are being used in campaigns you can navigate to the audience’s tab on the right-hand panel. Here you will see if any audiences are being used and if different bids are being used for these audiences. One of the keys to strong performance and account growth is activity in the account. As mentioned, you can check your change history to ensure actions are being taken to push the account forward. If no actions have happened in the last fourteen days, then you may want to start querying this. Results can be improved by testing and adjusting based on data gathered, so if no changes have been made in over a month your account is running based on old data. Once ads have been added into the account you want to ensure that these are being tested and refreshed and that Google is showing the ones that are performing best. Even small tests can have big variations in performance. Are there any big differences in Click Through Rate (CTR)? Are they appearing in the same average positions? Do they have similar conversion rates? If there are any big differences between these figures in each of the ads within an ad group, then you are missing out on potential sales or leads. You can spot test this by navigating to an ad group and going to the Ads & Extensions tab. You will want to ensure there is some statistical significance to the data, however, as with small numbers the figures can easily be distorted. Generally, you would want to wait till at least 1,000 impressions had been delivered. What is your max cost per click (CPC) compared with your Avg. CPC? Are your ads showing at the correct times of day and are there any bid adjustments in place? Are any of your keywords below the first-page bid? Do any of your keywords have a low CTR? Are any keywords spending highly but not converting? Are your ads being shown in favourable positions? Negative keywords are a way of blocking your ads from showing for certain searches and if negatives aren’t in place you could be paying for irrelevant and un-needed clicks repeatedly. Negative keywords should be added at the account, campaign and ad group levels to stop your ads appearing against low-quality searches. Using negatives, you can save money and improve the quality of your account. There are also standard sets of negatives (depending on your business) that you may want to check have been added. These are things such as words with negative connotations for your business such as complaint or hack. 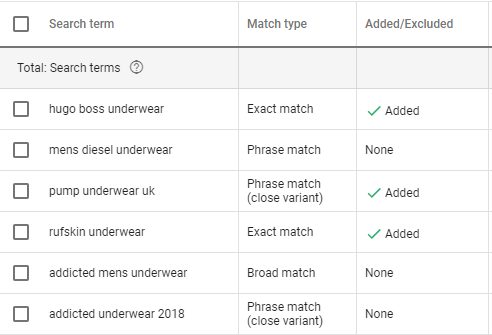 To sanity check for any negatives, you can follow Search Campaigns > Keywords > Search Terms which will display all searches one of your ads appears against. When broad or phrase match keywords are used in an account these enable you to find new keywords to target. In the search terms report, you can not only identify negative terms to block you can also find ones that you may wish to target. You can get an idea of if keywords are being mined from this report by looking at the Added/Excluded column. If a search term is getting a high number of clicks, impression or conversions then these should be considered for addition to the account as a keyword or negative. Auditing your Google Ads account is a key tool in ensuring your campaigns are performing as they should and checking everything is being done to achieve this. It is worth checking in on your account every 6-12 months. As always there may be reasons why the account is the way it is, but the key is ensuring you are aware and have the knowledge to be able to question it. This checklist should give you a basic overview of what you should be looking for. If you are not confident or don’t have the resources to audit your own account, then do get in touch. We have a range of audits that can either quickly sanity check your account or do a deeper dive.